Title: The title indicates the theme or purpose of the graph. For example, you can tell just by looking at the title of the graph that it’s intended to show the difference in workers’ pay based on union or nonunion membership. Axes: Most graphs have two axes — an x axis that runs along the bottom and a y axis that runs up and down the side. 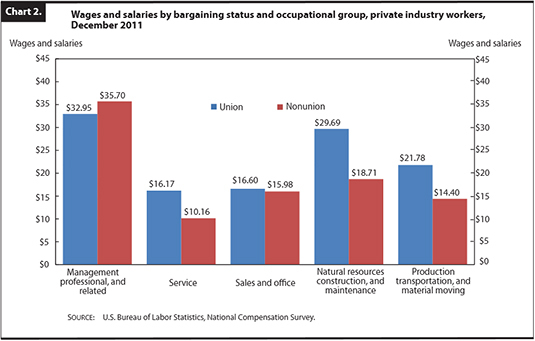 In the above graph, the x axis represents union and non-union earnings by employment categories. The y axis represents wages and salaries. Axis labels: The axis labels indicate what each axis represents. In the example, you can probably figure out what each axis represents based on other information in the graph; for example, the dollar figures along the left axis clearly indicate that the axis represents dollar amounts. The x-axis is complicated somewhat by being subdivided into two facets: employment categories, and union vs. nonunion earnings. Legend: The legend is a color-coded (or shade-coded) indicator of what each line, bar, or other shape on the graph represents. Plot area: The plot area is the central portion of the graph where all the data is displayed. Data points: Data points position data in the plot area. In this graph, for example, the top of each bar represents a dollar amount on the y-axis and workers’ employment category on the x-axis. Explanatory notes: Many graphs have additional text explaining something about the information presented visually. Read it carefully. This info is the graph’s “fine print” and can change how you interpret the material.